Can Plantar Fasciitis Really Be Cured? Plantar Fasciitis Tips features useful tips for plantar fasciitis suffers, including input from world-class expert doctors. What’s the difference? Dr. Jeffrey Johnson, Professor of Orthopaedic Surgery at WashingtonUniversity in St. Louis was kind enough to answer that question. There is no surgery for repair of plantar fascia tear. Plantar fasciitis is a thickening and soreness from chronic repetitive stress, and the structure is NOT torn or elongated. Sometimes plantar fasciitis is improved following a rupture, but usually they are not associated. Self-curing plantar fasciitis doesn’t just make it better; it keeps it from getting worse. Dr. Jeffery Ross (from the article Plantar Fasciitis in Basketball) explains why: “People who decide to just live with it allow it to exacerbate, develop more scar tissue. The plantar fascia, normally about 2 millimeters (mm) in thickness, can thicken to as much as 10 mm, making it that much harder to treat.” An entire centimeter (10 mm) jamming up under your heel like a rock in the driveway? SICK!!!! Sure, you may start feeling like your recovery from plantar fasciitis is almost complete, or maybe even you’re cured. So you let things slide and start walking around in just socks or bare feet, until you notice that old feeling of a lump inflaming and bulging under your heel. . Scar tissue. Thickening. “…as much as 10 mm”??? SICK! Damaging the tissue further makes recovery longer, more difficult, less complete in the long run. So say those gloomy gus M.D.s anyway. The “frozen” part of this formula – frozen water bottle – is questionable as a treatment, although if one has pain, numbing it always seems like a good idea. In 2011, when I was spending long days hiking the mountains for a mineral exploration job, I did roll the frozen water bottle under my heel. I also rested my heel on a frozen bag of peas to get the icing effect. But does icing the heel really have any value? Icing won’t hurt? That’s good to hear, but there are those who say it does, that icing your plantar fasciia does not just do no good, it actually prevents the plantar fasciia from healing. That advice is articulated, along with some advice on how to use heating to promote healing, at this Facebook posting by an anomymous podiatrist. Forgetting about the icing, how about rolling ANYTHING under the foot. It seems to feel like it’s doing something good, and it seems to be a way of massaging the tissue. Massage is said to help the plantar fascia to stretch, work on the scar tissue that thickens the plantar fascia and impairs blood flow, and relieve the entrapment of the medial calcaneal nerve beneath the heel. January 2015 – Thanks to a shrinking space industry, the “rocket scientists” have taken high tech into a lot of other industries. One of those is the design and fitting of ski boots for people with foot issues like plantar fasciitis. When I sought new ski boots after unpleasant seasons of pounding my feet on those flint-hard flat plastic boot bottoms, I went to my neighborhood ski store, Christy Sports in Golden, Colorado. 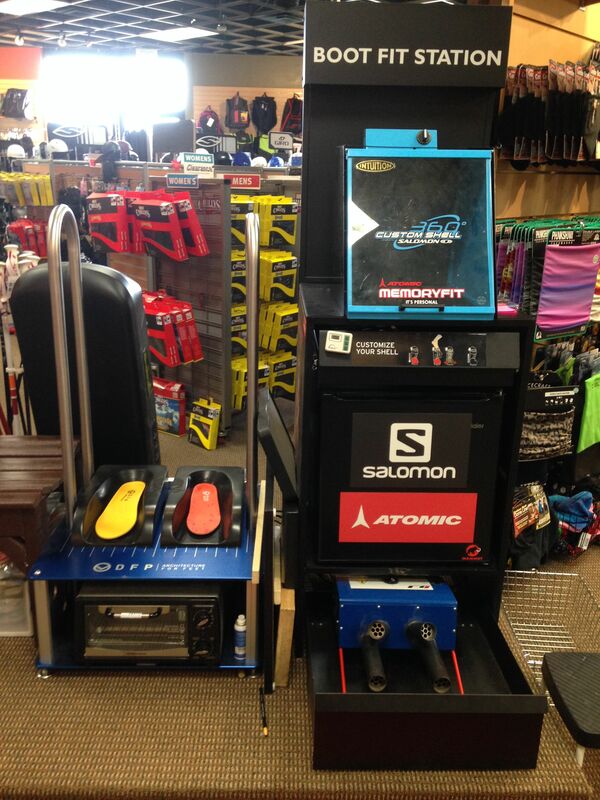 Christy’s boot masters put me on their high-tech machines, the DFP Architecture for Feet and the Atomic Memory Fit. You stand on the DFP foot positions and they use heat to custom mold the liner to your foot — and most importantly for the plantar fasciitis challenged, the bottom of your foot. The Atomic Memory Fit can cook the boot’s plastic part as well, molding the boot’s plastic shell to your foot, (which helped even on my old boots, where my ankle bone was too hard against the shell). Ten years ago, says my Christy boot master, this whole process would have cost $300 and taken four hours. Now it takes 20 minutes, and they just did it free as part of the boot-purchase service. There are also high-tech footbeds, not unlike those you can get for your regular shoes, and those too the machines heat-fit for foot bottom support and comfort. That was an extra expense of about $150, but with that inside the custom-molded liner inside the custom-molded shell, you can ski all day and clomp around the ski village pavement without any sensation at all of having plantar fasciitis. 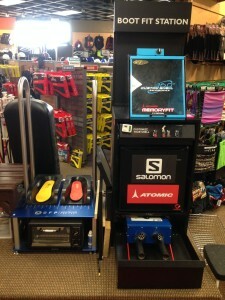 Any ski shop worth a hoot in YOUR area should have this technology and somebody who knows how to use it. About therapeutic plantar fascia injections of fluids – be it cortisone, platelet-rich-plasma (PRP) or even just saline solution – animal studies show that it weakens the structure of tendons or ligaments, inflating it, making it susceptible to rupture. Just putting fluid in has a negative effect biomechanically, even though that fluid does not stay in a long time before it is processed out. That is one good reason why doctors want you to be non-weight-bearing with crutches and/or a boot for a few days after injections, and why it’s important to focus on doing that. First of all, I should say that I don’t use any of these anymore since the cure, but I do remember when I first started and the PF pain was a real pain. Whatever the drawbacks, mentioned below, of these devices, I think they did really help in those early stages. I bought an inexpensive [well, $35.46 with sales tax] “Ace” brand “Plantar Fasciitis Foot Sleep Support” at Walgreens and strapped it on before bed. It has the benefit of being easily adjustable to increase the angle at which it pulls the foot up at the front. But as one who sleeps with a wool blanket and not a sheet, I also found it troublesome when the Velcro straps on calf and foot kept catching on the wool. So I tried the Strassburg sock [$39.95], which has a connection, typically a tube of cloth or other knit material, from the toes to the shin, pulling the toes closer to the shin, more specifically stretching the plantar fascia in the “dorsiflexion” stretch described in the Stretching page of this site. The Strasburg sock is just that, a sock, with no rigid components. It also has Velcro to hold it on the calf, and to secure the connection between calf and toes, but slips more smoothly under the blankets. The sock is so narrow that it’s devilishly hard to slip and roll it on. At the foot store, they told me no, there is not a larger size sock to make it easier to pull on. It’s supposed to be tight. A real pain for me, however. And another pain: with the sock pulling over the top of your big toe, it wakes you at night with the sensation that something hard has been pressing too long on the front of that big toe, and it hurts. I bought online the Adjustable Plantar Fasciitis Night Splint w/Wedge, by Ovation Medical and ordered throught National Brace & Splint. http://www.nationalbraceandsplint.com/Adjustable-Plantar-Fasciitis-Night-Splint-wWedge_p_661.html. What attracted me was the stiff plastic shell that goes down the back of the calf and under the foot, so the whole foot is cradled. And the fact that the straps have plastic buckles you can snap closed, and snap open by squeezing on the buckle release. Drawbacks: Biggest drawback is that the two lower buckles are way down on the side of the foot, and to snap them in you have to go through yoga-freak contortions that wrench your lower back. So the buckles are useless. You just have to leave them clasped and pull on the straps to tighten and affix with the Velcro. Also, if you have a sizeable foot, the end of your foot is sticking past the “shoe” of the thing, and there is no uplift on the foot front. And you can’t increase the angle at which your foot is being held up and plantar fascia stretched, because the hard shell is rigid in the approximately 90 degree angle. Also, unlike the first two night splints, it has cushioning under the foot that makes a sqeaking noise when I get up and walk in the middle of the night, which of course is not good if there is another person sleeping in the bedroom. I thought about sending it back for a refund of the cost of $26.97, but the additional $9.95 I paid for shipping is nonrefundable. So I would have to pay another $9.95 to send it back, which would reduce the refund to $17.02, and the hassle is not worth it. National Brace & Splint does have a Dorsiwedge night splint that has a wedge under the toes to lift them up more, but it’s $80 and I’m not in the mood to spill even bigger cash to order online something I’m not sure will not have its own drawbacks. So I would up using the “Ace” brand “Plantar Fasciitis Foot Sleep Support” and the Strassburg sock (adjusted with minimal as little uplift on the toes as needed to avoid pain), thinking to stay with that until I found something better. But after I was cured, I stopped worrying about it. A lot of the illustrations that show how to stretch show people doing it barefoot. NO BAREFOOT stretching and, in fact, no barefoot at all. When you get out of bed in the morning – even if you’ve had a night splint or done the plantar fascia stretching – you must not walk barefoot, says Deborah Nawoczenski, PT, PhD and professor in the Department of Physical Therapy at Ithaca College–Rochester Center. When you are doing the Achilles stretch or other stretches (except for the bedside plantar fascia stretch), do it as you do the rest of your day: wearing shoes with orthotics. Nawoczenski recommends eliminating barefoot walking throughout the day. And just to clarify, she adds, “shoes with orthotics” does not necessarily mean a custom arrangement, it can be an over-the-counter insole, just something supportive of the sole of the foot. Also not made clear in many instructions, and some illustrations: stretching should be done slightly pigeon toed during the Achilles stretches and during the stair-drop stretch. If not, you may be stretching your arch but not your Achilles. FootCare MD, a Web site of the American Orthopaedic Foot & Ankle Society, has some good illustrations of stretches. About the plantar fascia (or “dorsiflexion”) stretch, where one crosses the affected foot over the knee of the other leg and pulls back on the toes and balls of the toes with one hand: Some of us old fat boys, with bellies that get in the way and sensitive lower backs prone to spasms when we contort in the wrong way, may find this plantar fascia stretch on the edge of the bed almost prohibitively uncomfortable. One recommendation is to use a towel, around the ball of the foot, and pull back with both hands keeping the knee straight. Some podiatrists suggest that, from a standing position, you place the foot with toes and balls of toes against a wall, lean forward and hold for the stretch. I find that at any time of the day it’s convenient, and therefore more conducive to doing it often, to stretch the plantar fascia on the floor. Periodically I will pause and do the stretch against a wall; or slightly crouch, knee of the unaffected leg bent and the affected foot slightly behind and – keeping the toes and balls of the toes on the floor – rock the heel upward to stress the underside of the foot, and hold…as long as you want. This seems to work for me, but if any experts have a reason why this is less effective or ineffective, I’m happy to hear the anatomical reasons why. Who doesn’t enjoy walking around barefoot? Plantar fasciitis advice:DON’T! You’re going to a lot of effort (constant specialized foot and leg stretching, footwear and orthotics, etc. ), so why aggravate your condition by going barefoot? That includes padding around the house in socks which, to a plantar fasciitis suffer, is equivalent to barefoot. “Most people have more pain when barefoot, and we say if it hurts, don’t do that,” says Dr. John Wilson, a faculty member in the University of Wisconsin School of Medicine and Public Health, and a team physician for the University of Wisconsin Athletic Department. But wait, one might think. Why not walk on your toes and ball of foot like animals do (what we call the heel being, on dogs and cats, halfway up the back of the leg and never meant to be walked on. So THEY are walking on their toes, and it’s natural.). Then you are not walking on your heel, right? Arch supports in a shoe are a problem if they move around when you are taking the shoe on and off. I know it was a royal pain grinding my foot into a hiking shoe and then having to take it off again because the arch support slid out of place. With the full-length insole arch supports, this is less likely to be a problem, of course. But for those ¾- length arch supports, there should be something like the “Superfeet” brand arch supports, where they come with Velcro pads, one that sticks on the bottom of the shoe and one that sticks on the bottom of the arch support, holding support to one place in the shoe. I use the extra Velcro pads I buy at the Good Feet store, for example, to hold in place the “Blaue Fussbett” arch supports recommended and sold by my podiatrist. The Blaue Fussbetts are among the arch supports that do not come with Velcro stabilizers, but the folks at the local shoe store where I bought a second pair of Blaue Fussbetts say you can probably pick up Velcro tab combinations at other places, a fabric store for example. Walking and standing on hard, flat surfaces, are among those things that make plantar fasciitis a real pain. Docs and physical therapists recommend considering cushioned floor mats. A ½-inch to ¾-inch rubber mat that is a little denser will give true cushioning, they say: something dense and thick enough that the heel doesn’t bottom out on the floor. Cushioning floor mats don’t help to cure plantar fasciitis any more than do icing the heel or taking ibuprofen or other inflammatories. But like those other measures, they help make it less painful while you’ve got it. Say you’re a hair stylist who spends a lot of time standing in one place, for example. Or maybe you spend a lot of time standing in the kitchen, cooking and washing dishes and so on. Or maybe you want something comfortable in front of the bathroom vanity. Or maybe you spend a lot of time behind a counter at the job. Anywhere you’re going to stand, you need something better than a cloth rug. Cushioning floor mats are widely available, and they don’t have to just look like a big patch of rubbery cheap. GelPro brand gel-filled floor mats, for example, come in umpteen colors and styles as well as different thicknesses, for household as well as commercial uses. But don’t take too seriously the photo on the GelPro home page, which shows a model standing on a GelPro mat at the kitchen counter in bare feet. Maybe that’s fine for the other physical complaints such mats are intended to help, but the experts advise against us plantar fasciitis people walking in bare feet because it irritates, and “microtears” the plantar fascia and counteracts all the other things we work so hard at to self-cure the problem. Tip: How Active Should You Be? Resting the foot is sometimes recommended as part of the orthotics/stretch/etc. self-cure regimen, but what about people who have to keep working their feet? People who work in retail and service sectors, for example. And what about activities we want to do or should do simply for exercise? If you like to ski, go ahead. Especially with the rigid boots, skiing won’t hurt the plantar fasciitis recovery. Bicycling is another good activity, although if one goes for a long bike ride and it seems to have irritated the condition, you may be just stressing the ligament that’s partially torn. About stretching (and footwear and orthotics) aimed at maintaining and extending the plantar fascia longitudinally, the idea is that it’s the tightness of the plantar fascia that causes the irritation/inflammation that is plantar fasciitis. That’s what they do in plantar fasciitis surgery, the “partial transection” which lengthens the plantar fascia, but those other approaches are what more than 90% of people can do to “self-cure” without surgery.